Jun 7, 2015 – Here are some ideas for children and families during the months of June, July, and August. The ideas that I suggest coordinate with the annual cycle of readings listed on Through the Year with The Urantia Book for those months. The Urantia Book says that temples were constructed long ago in honor of the Universal Father. One was built in the city of Dalamatia and one was also found in the Garden of Eden. That got me thinking about the month of June. Why? Well, Father’s Day is celebrated during June in many countries throughout the world. Also, the annual cycle begins in mid-June with Paper 1 The Universal Father. Lastly, temples like Stonehenge come to mind as we draw near the solstice. Midsummer festivals are filled with ancient images and lore. So, why not encourage children to build their own “temple to the Father” in their backyard? The temple could be constructed out of natural materials such as stones and sticks. It need not be large; a miniature temple in a garden space would be inspiring to gaze upon. During the quiet and unhurried days of July, children and parents could do some reading from the early years of Jesus’ life. 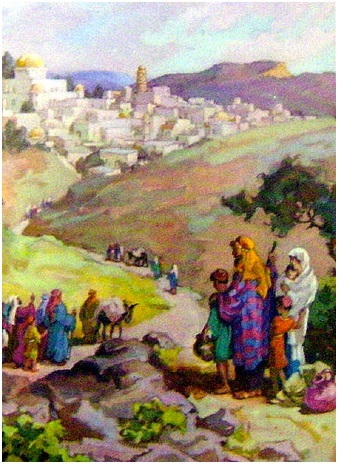 Charming scenes from the simple life of the Nazareth family can be imagined and brought into everyday life. Playing with blocks and sand, caring for flowers and vines, gazing at the night sky, modeling with clay, helping with younger siblings, fishing, tending to the needs of animals, and walking everywhere you need to go. Twelve-year-old Jesus and his parents even walked for four days on their pilgrimage to the temple at Jerusalem for the Passover feast. And speaking of pilgrimages, did you know that the Gaelic festival of Lughnasadh on August 1st is traditionally observed with the making of a mountain pilgrimage? This fact coordinated nicely with the August readings about Jesus’ travels throughout the Mediterranean. We also learn of his year of “solitary wanderings”, culminating in his sojourn on Mount Hermon during late summer. Families could make a mountain (or at least a hill) trek together. The PBS series “Sacred Journeys” said that pilgrimages are more popular than ever, and 200 million people make them each year. UB Youth used to travel extensively during the summer—a pilgrimage of sorts. It would be wonderful to have a pilgrimage route for Urantia Book readers, wouldn’t it?